They call it a "rest day" and mostly it was. But we did manage an hour hike to keep our legs moving and our blood pumping to continue the acclimatization. We hiked up to the headwaters of the Relinchos River that we had followed all the way up from the Vacas Valley yesterday. 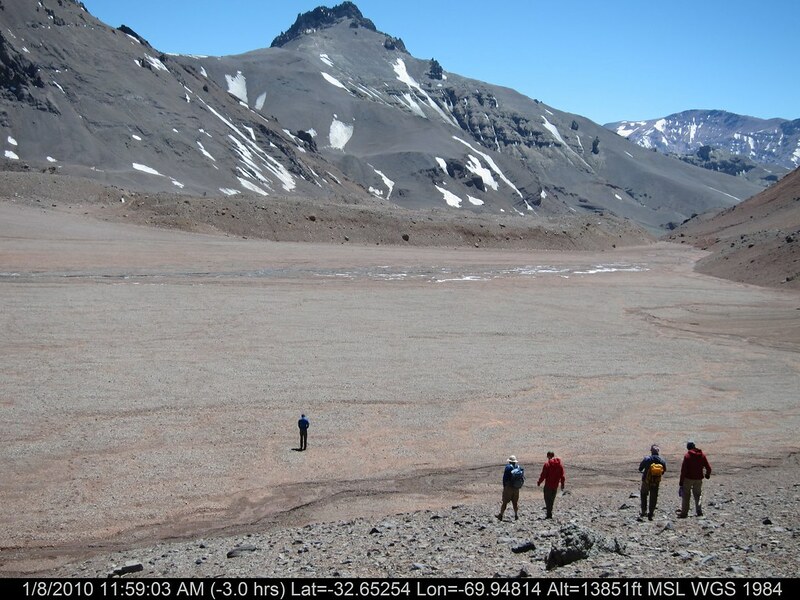 Our base camp, Plaza Argentina, actually sits atop a glacial moraine covering ice and just a little further up the valley the ice melt trickles to the surface and forms the headwaters of the Relinchos River. Walking up that valley was like walking on the moon. On our return, I declined the $20 USD shower they offer here at base camp and instead opted for $1.29 worth of baby wipes to take care of business. With the real climbing starting tomorrow, I changed out the trekking clothes I had been wearing for four straight days and into my clean climbing gear. My tent mate, Steve, thanked me. I was pretty pleased myself. After, I spent some time in the tent organizing my personal load for tomorrow's carry up to Camp 1. In addition we will each have an allocation of group gear (cookware, food, fuel, etc.) that we will use at Camp 1 and higher to carry up. We will leave these loads at Camp 1 buried in rocks and then we will return to base camp for the night. The following day (Sunday), we will break camp and move it all up to Camp 1. All of our trekking clothes and gear that we don't need on the mountain will be packed into our mule bags. These will be carried out via mule and returned to us at the Plaza de Mulas base camp that we will descend into on the other side of the mountain at the end of climb and before our 16 mile trek out. I'm not ready looking forward to getting into those trekking clothes again but that's how we roll. Round trip for our carry to Camp 1 tomorrow should be about 5 hours putting us back at base camp around 3pm. Weather was again perfect today and it would have been an excellent summit day. Let's hope that holds. Feeling good Louis. Looking good Billy Ray.